Ruth Lehrer is a poet, author, and American Sign Language interpreter. She lives in the woods of western Massachusetts. A desperately sad story of profound abuse is softened somewhat by the highly intelligent Duck-Duck and her loving mother. But neither love nor grief is linear. Fishkill's guilt, anger, and abandonment only intensify as the story unfolds, leaving her desperate and unsure where to turn...Abuse is eclipsed by love in this moving novel. Lehrer pulls at heartstrings in her thought-provoking debut...a complex and well-plotted work. In Lehrer’s engrossing first novel, 12-year-old Carmel Fishkill (named after a highway exit sign her mother, Keely, glimpsed while giving birth in the back seat of a car) decides that starting seventh grade in a new school is an opportunity to toughen up her image...The plot, as well as Duck-Duck and Fishkill’s friendship, twists and turns as Keely reappears and disappears, until a tragic development changes the entire tone of the book, providing a bittersweet resolution. Lehrer’s debut is well written and touches upon tough subjects such as bullying, abuse, and teen pregnancy in a lyrical but age-appropriate way. Fishkill lives a hard life, but the book speaks to how schools and institutions handle students in poverty. A great purchase for public libraries. The deep sadness undergirding this story is held in check, rhetorically speaking, by Fishkill’s matter-of-fact, survivalist perspective and a fast-moving plot...Fans of Catherine Ryan Hyde’s rescue dramas are the audience for this. 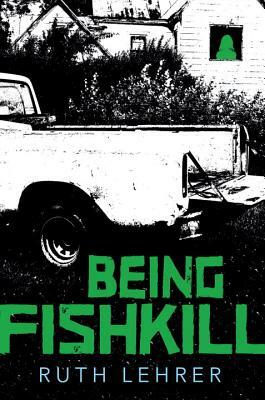 In the year’s most heartwarming, heartbreaking teen novel, Carmel Fishkill – who’s been abused for years – decides to reinvent herself and change her name to Fishkill Carmel. After she finally finds some solace, her unstable mother reappears. Poet Lehrer’s YA debut is a beautifully written and authentic look at rural poverty, and a great choice for fans of Kody Keplinger’s Run and Sarah Nicole Lemon’s Done Dirt Cheap.